Lately there has been a lot of talk about hacking. Criminals are getting into corporate databases and getting people’s email addresses or even credit card information. For those hackers who get your email, they may send you something that can wreak havoc on your life. We’ve all received suspicious emails without knowing whether to open them or not. If you’re in doubt, do not click on any links or attachments! There is annoying spam, which is harmless. However, in the past couple years there have been more and more cases of dangerous spam. Cases of ransomware – holding your personal data for ransom – are the most frightening. Some breaches require software to be added to your computer in order to fight back. Most of us are familiar with the Nigerian prince scam, but there are many others out there including lottery winners, tax scams, expired warranty claims, religious, fake contest winners and all kinds of other ways to bilk hard working people out of their money. There are some easy ways to spot dangerous emails. If you receive an email from a credit card company, bank, investment firm or any other company where you do not have an account that talks about your account – that is suspicious. The content of the email may mention how your account is overdrawn or some other problem. You know you don’t have an account with them, so you can’t be overdrawn. Simply delete the email. If you look at the first image, you will see an email I received recently. It claims to be from Wells Fargo. I no longer have an account with Wells Fargo, so that was a red flag for me. Secondly, it says “Dear Member.” Banks always have a custom greeting that includes your name. That was red flag #2. The next red flag was the first sentence. It is not written in plain language. Banks are clear and concise with their messages. If there are misspellings (there are none in this one), that’s another red flag. Absolutely, under no circumstances, click on an attachment if you are unsure of the sender! In the second image, you will see that if you click on the sender’s name, you will see their email address. 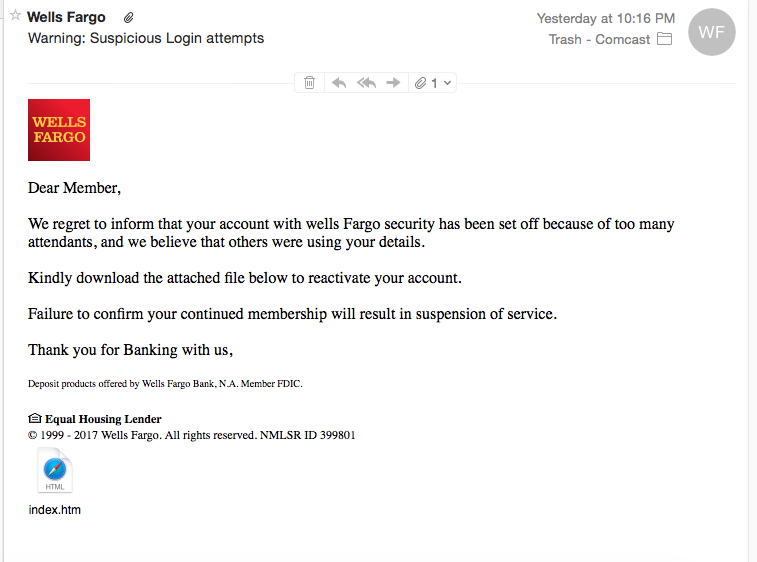 Obviously, that email is not coming from Wells Fargo. A real email from them would be from wellsfargo.com and not some foreign country. 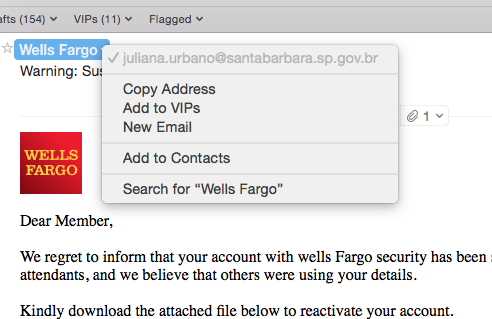 Sometimes they get tricky and have an email that might have Wells Fargo within the email address like wellsfargoaccounts@gmail.com, but if it’s not from wellsfargo.com, it’s not from them. If you get what you think is a suspicious email and it’s from a company where you do have an account, don’t reply to it. Never click the link in the email if you are unsure. It can end up putting a virus on your computer. You can call them or go to their website and ask them if they sent the email. It’s better to be safe than sorry. I used to try to report suspicious emails to companies when I received them, but found it was incredibly time consuming. Many times banks, cable companies, phone companies, etc. have places where you can report suspicious emails to help them put a stop to the activity. Unfortunately, most of the time, it is difficult to find that information on their sites. I have often reported suspicious emails to PayPal as their information was easy to find. You simply forward the suspicious email to spoof@paypal.com. The address for suspicious Comcast emails is abuse@comcast.net. When you forward an email, it contains all of the header information (who sent it and from where it was sent) so the company can try to stop these people from hurting anyone. There is virus protection software that will weed out at least some of the bad emails. Avast is a free anti virus program that works for Mac and PC computers. It used to be that Macs were such a small part of the home computer market that no one attacked them with a virus or malware. Today everyone needs to have some form of protection. If you have older family members using email, it is important to let them know how to spot suspicious emails and to be leery of them. That demographic is the most vulnerable. Be safe with your emails and use common sense before responding to emails from large companies or opening any attachments.